A relaxed but lively atmosphere, rustic Spanish décor and a fun place for any occasion whether it’s dinner for two, a family celebration or a party. The varied menu includes a great range of mouth-watering and inexpensive tapas together with traditional Spanish and Portuguese dishes, all freshly prepared and served by friendly and helpful staff. 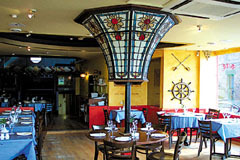 The affordable prices and lively atmosphere make El Pirata one of Blackheath’s most popular restaurants. “Mucho gusto amigos”! Open every day noon-midnight. All major credit cards accepted. 12.5% service charge. Portuguese cuisine consists of simple ingredients impeccably prepared. It emphasises on fish, meat, olive oil, tomato, and spices and features hearty soups, homemade bread, cheeses, as well as unexpected combinations of meat and shellfish. The menu will reveal the full extent of Portugal's love affair with seafood. Specialties include. Bacalhau � Gomes de S�, essentially a casserole of cod, potatoes and onion, lulas recheadas � lisbonense (stuffed squid Lisbon-style) Cozido � portuguesa, a one-dish meal of beef, pork, sausage and vegetables, porco � alentejana (pork Alentejo-style) not forgetting the highly aromatic peri-peri chicken. Fantastic selection of Tapas and traditional Spanish and Portuguese dishes.